Larry's Tip: Now is a great time to plant winter pansies. These plants can last from fall to spring in protected areas. Stop by today and see our large selection. We'd be happy to discuss with you the best ways to keep your pansies safe through the winter weather so you can have a beautiful outdoor garden all year long. Hello Melissa...It would be best to try and take a cutting from from the plum tree.The proper time to do this would be in March just prior to new growth leafing out. Cut off about 6-8” of a branch tip. Carefully scrape the bark off the bottom part of the cutting up about an inch.Take a 6” plastic pot and fill with 50% sand and 50% potting soil. and water thoroughly. Insert the cutting about 2” into the soil. Try and mist the cutting several times per day to maintain high humidity. Do not keep the soil waterlogged...just keep it evenly moist. In 4-8 weeks it MIGHT root. This is much easier in a greenhouse with bottom heat and a commercial type mist system. Doing this in the house is much harder. It may not grow true from seed so I would forget that idea. Q: Larry, What can I do about tomato blight? Sign up for the Mary's Greenhouse newsletter to receive e-mail updates on our new arrivals, special offers and gardening tips. Visit us on Facebook and take advantage of the opportunity to Ask Larry! your plant and gardening questions. 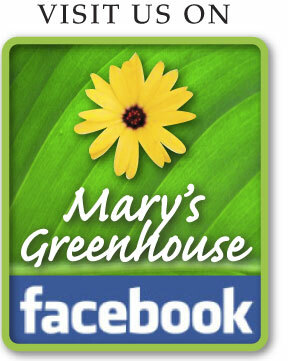 Larry Gouer is Mary's Greenhouse owner and a WV Certified Horticulturalist.